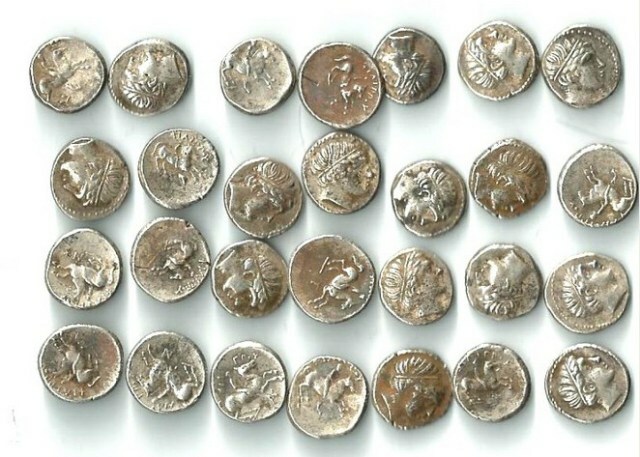 Customs officers at Sofia Airport blocked an attempt to smuggle 82 silver coins believed to date from the time of the fourth century BCE king Philip II of Macedon, the Customs Agency said. [...] The coins were hidden in three routers and were to have been taken from Bulgaria to the United States. Investigations were continuing, the agency said. 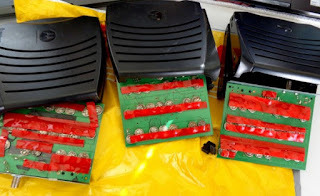 The photo shows what seem to be these coins taped to the underside of printed circuit boards in the electronic equipment. The recipient of a shipment prepared in this manner was obviously aware of what they contained, and therefore participants in the USA had been party to the organization of this smuggling attempt. Are they too under investigation as part of an organized crime group? Or is the USA turning a blind eye to this one too? To whom were these three dodgy shipments sent? Are there any US coin dealers selling ancient coins - real or fake - as well as 'surplus' computer equipment on eBay? Check it out. How would they have been marketed? No doubt as "Old-Collection-just-happened-to-have-lost-its-paperwork" material like the vast majority of coins sold by US coin dealers. 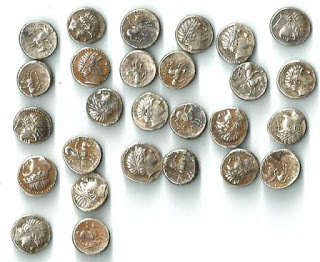 A coin collector has contacted me to point out the article is incorrect identifying the items seized in the first line as tetradrachms of Philip II of Macedon. 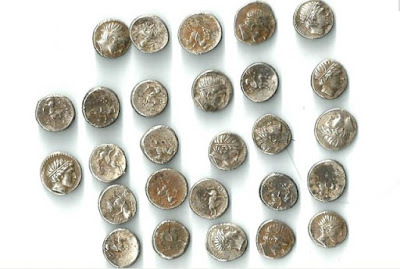 There are now better photos of those coins available here: Ivan Dikov, 'Bulgarian Customs Capture US-Bound Smuggled Treasure of Silver Coins of King Philip II of Macedon', Archaeology in Bulgaria, June 12, 2015. I am very glad that the Bulgarian customs authorities were able to stop this shipment from leaving Bulgaria and getting to the USA. Can I just add a few minor corrections? 1. Since there is no scale we really are not 100% able to know their true size but they are like no known tetradrachms; rather, if anything they are 1/5 tetradrachms (they should weigh c. 2.5 g each; a nice selection can be viewed in SNG Greece II, Alpha Bank, Macedonia I, 290-325). 2. Terming them tetradrachms of Alexander III, as you do in your first line) is an error. 3. Terming them a dodgy shipment is correct, especially since it is quite obvious from their surfaces, style and appearance THAT THEY ARE ALL MODERN REPLICAS (i.e., FAKES) OF THE TYPE IN WHICH BULGARIAN CRAFTSPEOPLE SPECIALIZE. Think of it, if this garbage had gotten to some idiot in the USA who then sold them to unthinking collectors, perhaps when their buyers found out they had acquired worthless junk they might have sworn off collection forever and joined SAFE. You may be "very glad" that a Bulgarian was arrested while his US accomplice gets off scot-free to trade again. I was following the original article, I have not seen the coins. I think there is a tendency in articles like this for the objects to be illustrated using a stock image or (as may have happened here) someone posing the find using whatever is to hand. To a newspaper journalist in Bulgaria and most readers, a coin is a coin. There are a lot of "idiots" in the US selling coins and buying them, though how many are driven by "idiocy" to join the ACCG and how many SAFE I would not care to say. There do seem to be a whole lot of idiots in the ACCG however willing to jump when told to "jump" but very few SAFE members I think follow these Tompa-IAPN instructions with such devotion. Just a quick note: if you blow up the photographs of the coins in situ packed in the routers (you can do that via the original site) you will find that they are the same coins as those in the record photographs of the coins alone. Thus, the only way we can assume that the coins in the coin photographs are file copies (since you point out that Bulgarian journalists cannot tell one coin from another), is that the photographs of the coins as found in the routers are staged in some manner. If that's the case, and without any indication of to whom the routers were meant to be sent in the USA, could it be that the whole thing is some kind of publicity stunt by the Bulgarian police to show how clever they are? If you are right and the seizure was of counterfeits, since the coins in question do not seem to be marked "copy", under the 1973 Hobby Protection Act it is illegal to import them into the United States, no? So the dealer to whom they were being sent in the US was conspiring to commit an illegal act. Presumably money changed hands internationally, and the coins were not being sent s freebies from the goodness of a gangster's heart. Or maybe the dealer bought real coins which were switched for fakes in some scam after the money had been received? Who knows? The main point is that coin smuggling DOES go on (see Elkins' published papers on this), and when the coins reach the US market there is no problem mixing them with the other stuff which has "conveniently" lost its paperwork. And yes, I am sure that sleazy geezers who'll sell you smuggled stuff looking you straight in the eye and swearing blind it's all old collection stuff would have as few qualms about "accidentally" palming off on unsuspecting buyers the odd fake sold at the price of an original.